There are six sizes of Bio-Mats, with the Professional Bio-Mat, Mini-Mat, and Bio-Belt being the most popular. Each of these Bio-Mats use the same basic construction, so that size is the main difference. The Bio-Belt uses different gemstones, but is otherwise identical. Below is a brief overview of the mats, which may help you in making your selection. 28" x 74" x 1" 20" x 34" x 1" 8" x 18" x 1" 35" x 78" x 1" 55" x 78" x 1" 73" x 78" x 1"
The most popular Bio-Mat is the Bio-Mat Professional. This Bio-Mat is massage-table size (28" x 74" x 1"). This is an excellent Bio-Mat for therapy or therapeutic sleep. People like this because it provides a full-body coverage, and is portable. It comes with a travel-size suitcase, and quilted pad. It can be folded up, placed in the case, and taken on a trip, or brought over to friend that may need help. The Bio-Mat Professional Set includes the Bio-Pillow. The Pillow is designed to keep the head cool while you are heating the body, and still carry the energy of the Bio-Pat into the head area. The Bio-Mat Professional may be purchased with or without the Pillow. We recommend the Pillow, especially for therapy. The Bio-Mat Professional was initially designed for Massage Therapists. For those with certificates or licenses in the health care field, a $100 discount is available from the manufacturer. If you qualify for this discount, you will need to submit a copy of your license to process your Bio-Mat order. Click here to see the requirements. 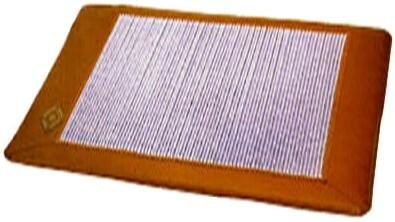 The Mini-Mat is the second most popular Bio-Mat. This dimensions of this mat are: 20" x 34" x 1". This mat is designed to be used in a chair. It may be used while bent at a 90 degree angle while in a chair, or laid out flat. There are some people that sleep on the Mini-Mat, although it only covers the part of the body. The Mini-Mat weighs only 14 pounds, and is very portable. It comes with a travel case, and a quilted pad. The Bio-Mat Single is the size of a twin bed. We generally recommend this for larger people. For most people, the Bio-Mat Professional is a preferred alternative. The Single size Bio-Mat does not have the same portability as the Professional, and would only be used on a bed. This mat weighs 36 pounds. The Queen and King-size Bio-Mats are the size of queen and king beds. This is the ultimate for a complete covering of the bed. One advantage of the larger mats is the surface area allows it to produce a large volume of negative ions and infrared. These are not portable. The Queen weights 56 pounds, and the King weighs 75 pounds. The Bio-Belt is designed to be used around the waist. The belt, though, can be removed and the Bio-Belt is then like a miniature Bio-Mat that can be placed anywhere. It also has a mixture of several gemstones, and produces a slightly different energy than the amethyst Bio-Mats. For a little mat, it can be quite powerful. The Bio-Belt was designed to reduce belly fat. It is excellent to alleviate headaches, sever back pain, neck and shoulder pain, and foot pain. The Belt is nice for spot therapy. The Bio-Belt is not designed for sleeping, except for short naps. It has a safety timer to automatically shut off after one hour.